Writer-director Sean Anders is the man behind some of the more popular comedies of the last ten years: Hot Tub Time Machine, We’re the Millers, Horrible Bosses 2 and Daddy’s Home. He’s known for his over-the-top, raunchy screwball-comedy. However, his latest picture is more of a blend of comedy and drama. 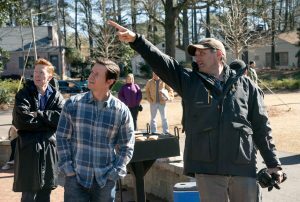 It’s called Instant Family and stars Mark Wahlberg and Rose Byrne. The two actors play Pete and Ellie, a couple looking to adopt a child. After deciding they are “special” enough people to adopt, the two begin the process. They search for the ideal kid and finally find a teenager named Lizzy (Isabela Moner). What they didn’t know is that she has two younger siblings—Juan (Gustavo Quiroz) and Lita (Julianna Gamiz). Just like that Pete and Ellie become mom and dad to three children. The trials and tribulations that follow make the couple wonder if they are in over their heads. The real touching aspect of Instant Family is that Ander’s real-life story inspired it. He and his wife adopted three children—a six-year-old, a three-year-old and an 18-month-old baby—seven years ago. Below is my interview with Anders where we talk more about his personal story and the upcoming movie. SGFP: Instant Family was inspired by your real-life story of adopting three children. How did the conversation of adoption start in your home? SA: It happened just like it did in the movie. My wife and I, for a long time, felt we couldn’t afford to have kids and then, when I started doing better financially we started having the conversation.